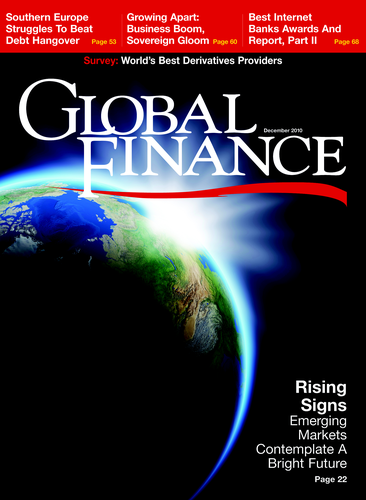 In the second of a two-part series, Global Finance identifies the best corporate/institutional and consumer Internet banks globally and in six regions, plus an overall winner. 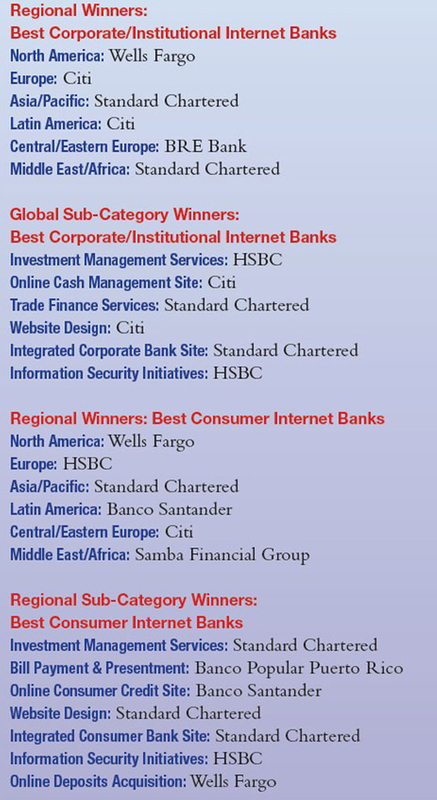 We also name global winners in six corporate/institutional subcategories and seven consumer subcategories. As electronic banking, the fastest-growing payment system, continues to change and evolve rapidly, the best Internet banks quickly adapt to and meet such challenges as new security threats, forms of fraud and government laws and regulations. At the same time, they seize opportunities such as new mobile-payment applications, social media development and rapid growth in emerging markets. Once again with the help of Infosys Consulting, Global Finance has identified the leading banks that are innovating and prospering online. 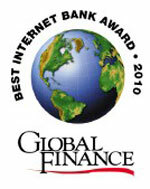 Global Finance's World's Best Internet Bank Awards are based on submissions from banks that wish to be considered. 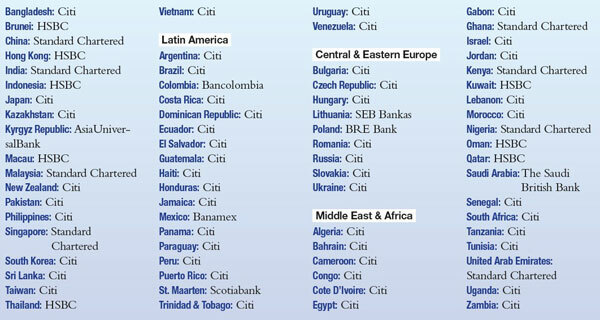 This year 247 individual banks from around the world entered. 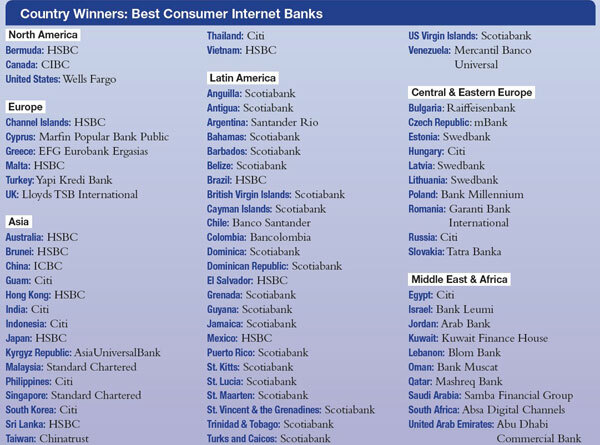 The Internet banking leaders include Banco Popular Puerto Rico, Banco Santander, BRE Bank, Citi, HSBC, Samba Financial Group, Standard Chartered and Wells Fargo. These banks are using Internet and mobile banking to convert existing clients into more profitable and loyal online customers, improve customer service, foster cost efficiencies, capture deposits and boost payment and trading revenue. The Web is also key to these banks' efforts to enter and grow in emerging markets, find new customers and adapt to changing technologies and customer preferences, such as social media and mobile computing. The top online banks never rest on their laurels. "They keep on taking into account customer feedback regarding products, features, experience and so on, and expand their breadth of online functionality and improve the online processes," says Lars Skari, partner and practice manager, banking and capital markets at Infosys Consulting. "At the same time, they are responding to competition from traditional and newer sources, changing fraud/security challenges and leveraging newer, better technology to upgrade their websites." Here are highlights of just some of the winning banks and online banking services capturing acclaim from our judging panel. Standard Chartered has been innovative and aggressive with its Breeze online banking service, which it offers in Singapore and Malaysia and soon will roll out in Hong Kong and India. The bank offers the service as an app for the iPhone and iPad (the latter is available in Singapore only, for now). Breeze lets users in Singapore issue a bank check, pay bills on the go, personalize their banking experience and redeem credit-card reward points online. Samba Financial Group's online banking service offerings include two-way mobile SMS banking, a private Samba.com mail box through which clients can send secure messages to Samba and receive messages from the bank, and an online alerts service called Samba@lerts. 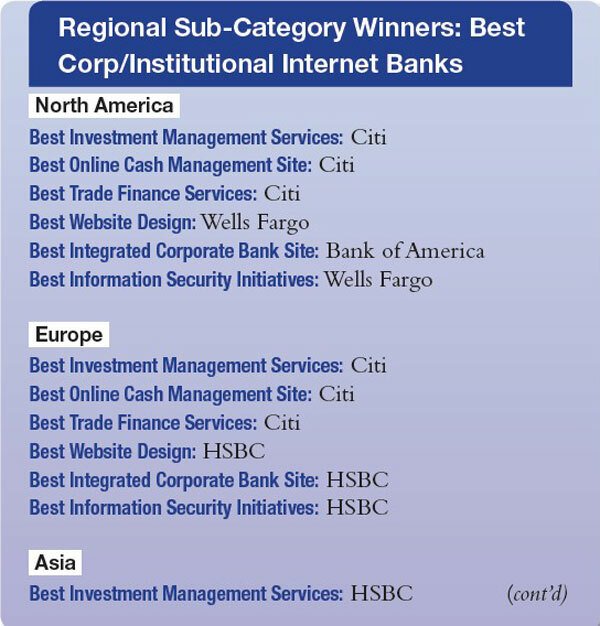 Citi, the global winner for both best Internet bank and best corporate/institutional Internet bank, receives plaudits for its CitiDirectBE (Banking Evolution) collaborative online banking platform for corporate and institutional clients. The product's features include an electronic bank account management module (eBAM), enabling customers to circumvent the paper and duplication associated with account openings, document signing and account maintenance, across multiple legal entities and accounts. "For example, corporate treasury departments can use CitiDirect BE to significantly reduce the time it takes to open and maintain bank accounts," Gary Greenwald, chief innovation officer of Citi's global transaction services business, said in a news release announcing the product launch last year. "By making use of digital signatures, they can automate what historically have been paper-intensive processes, achieving greater efficiency, visibility and control, as well as enhanced auditing procedures." Going forward, these and the other winning banks will have to continue adapting and innovating with their Internet offerings to stay ahead of intense competition from other banks and services providers.